The wedding cake is quickly turning into one of the main stars of any wedding day. Everyone anticipates a wedding cake to be a true work of art, in complete harmony with the wedding’s decoration, a major eye-turner and, of course, delicious. Cakes with boring flavors and icings, whose only sole purpose is to be eaten, are a thing of the past. The new classic wedding cake is an elegant 3-layer cake. The bride and groom are choosing, more and more, a classic and tall wedding cake, with a simple design. Afterwards, it’s just a matter of giving it that special touch: topping the cake with a crystal monogram of the bride and groom’s initials, decorating it with natural flowers, silver beads or any other detail that coordinates with the wedding’s decoration or your personal style. The classic wedding cake is definitely round, but the truth is that there are many different ways and shapes to get around that, such as an octagonal, square or hexagonal design – these are some of the most popular shapes right now, following the traditional round wedding cake. These types of shapes are more appropriate for casual and relaxed weddings. 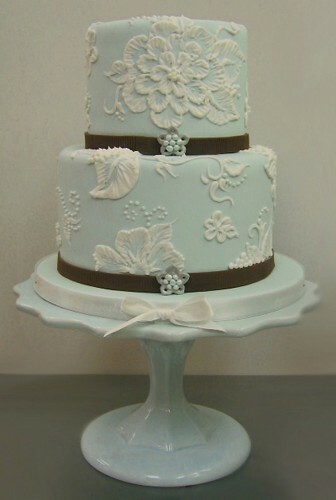 Although very simple, these uncommon shapes give a towering wedding cake a more modern and less classical look. The various layers of a wedding cake, placed on pillars, separate plates or stands, are on the verge of extinction. Most brides and grooms are opting for a multiple-layer wedding cake, placed directly one on top of the other. Sometimes, the interior of some these layers are fake and used only for decorative height. 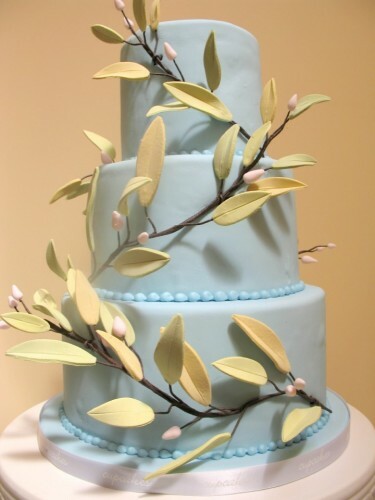 If the cake becomes too heavy, the cake designer may use pillars for added support, camouflaging them with fruit or flowers (natural or made of sugar), so that it may seem that the cake’s layers are one on top of the other. This way, a beautiful work of art is created. Many cake designers create colorful wedding cakes which remind us that a color wheel exists and that it may be used in the kitchen. Pink, blue, pistachio, lilac and cream icings are used (among other colors), so that the cake may also be a reflection of the wedding’s decor. 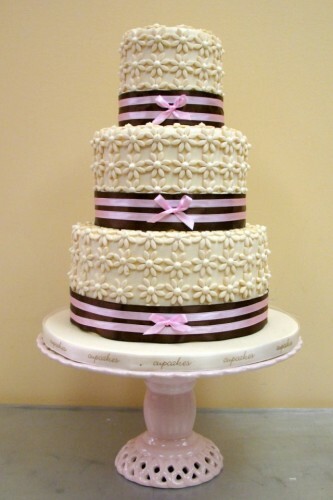 The cake can also be decorated with satin ribbons or flowers of many colors, becoming reminiscent of a spring party. 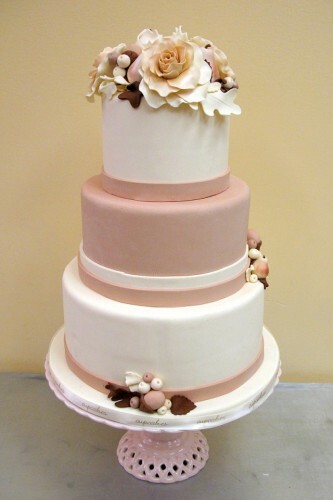 Fresh flowers are always a great adornment for wedding cakes. 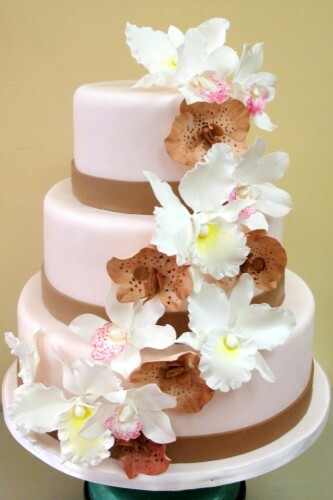 On the other hand, sugar flowers are true works of art that give the wedding cake a very artistic and elegant touch. The most popular flowers include orchids, roses, tulips, daisies and gardenias. Rose petals, edible or crystallized flowers are additional great options. A monogram of the bride and groom’s initials, made out of rose petals, is another elegant idea. 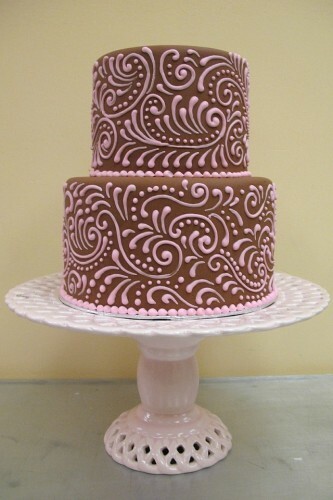 One of the most popular and distinct wedding cake flavors is chocolate. Many brides and grooms have a special adoration for the richness of chocolate and couldn’t imagine having any other wedding cake – be it all chocolate or simply covered in chocolate frosting. One great idea is using chocolate as a surprise ingredient: the inside of the cake can be made entirely of chocolate and the outside covered by a pistachio or colored frosting. The big reveal only occurs when the cake is sliced! Some of the most popular choices for a chocolate cake filling include raspberry, mint, passion fruit, mango or orange liqueur mousse. One of the most recent trends for more casual weddings is a wedding cake made of cupcakes. 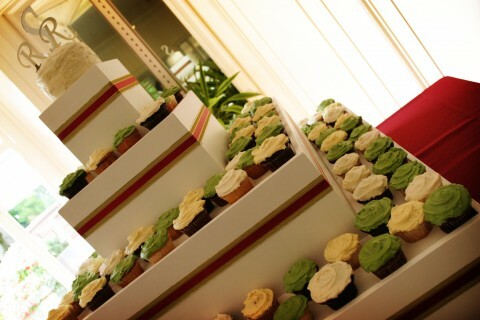 There is one cupcake for each guest and optionally a small cake for the bride and groom to cut the first slice.